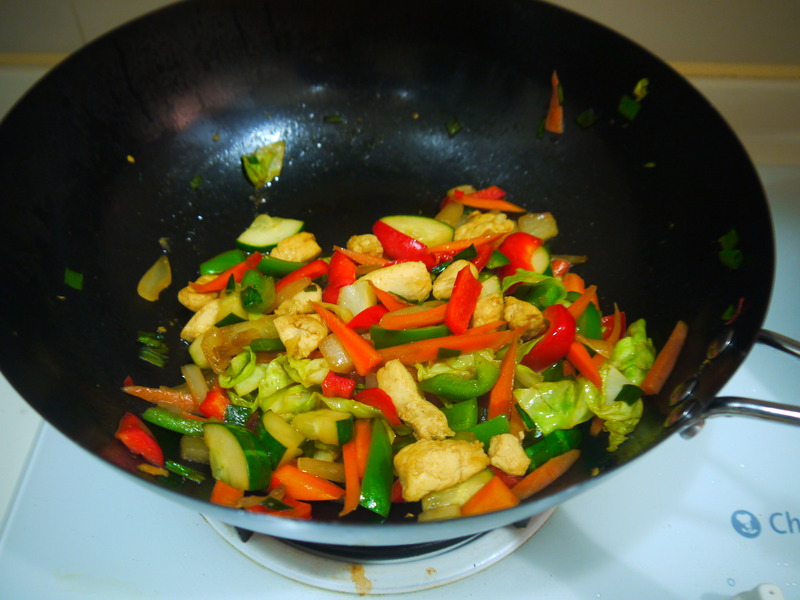 I feel like I haven’t blogged about food in a while, so here goes! On Sunday morning, I woke up convinced that I had to cook myself a balanced and healthy dinner that night. On my way home from church, I stopped by the Hung Hom local market and bought a variety of groceries – cabbage, peppers, carrots, a cucumber, and spring onions. I had no idea what I was going to make so I decided to go with the flow of whatever my fingers picked. 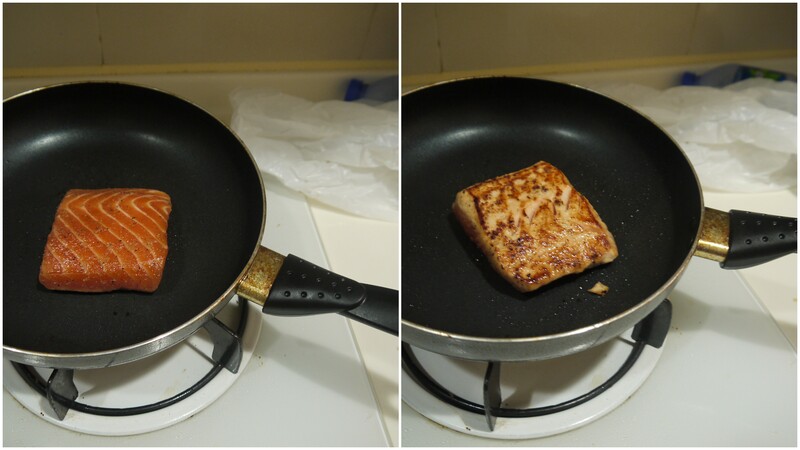 I always cook with shrimp and chicken so I decided to try something different, I got myself a nice (but relatively expensive) filet of salmon. On reaching my apartment building, I got the sudden urge to buy potatoes so I ran back to the market to buy a few. I hadn’t eaten boiled potatoes since summer! I forgot I had signed up to cheer for a track meet, so that took up most of my afternoon. Our group ended up having (free) dinner together afterwards at a nearby Chinese restaurant with amazing dishes so that discarded my plans to cook that night. I don’t mean to brag, but this meal was perfect! That was the juiciest piece of salmon I had ever had and I’m sure I wouldn’t have found that in any restaurant here. 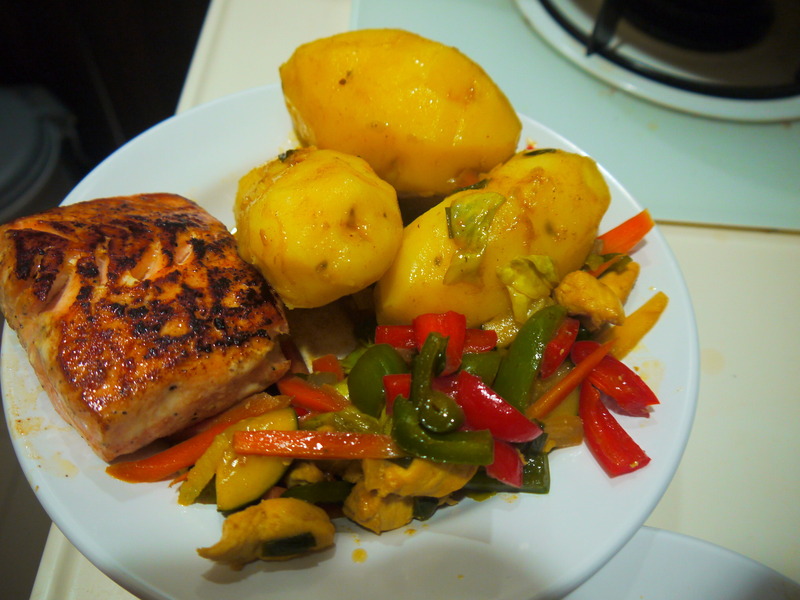 Try the recipe out, it’s really easy to make and promises a tasty piece of fish! I didn’t have brown sugar, so I used normal granulated sugar with a chili soy sauce and corn oil. Yummm! This entry was posted in Food, Hong Kong, Uncategorized and tagged allrecipes.com. Bookmark the permalink.